The old adage goes that if you want to find the best gaming PC, you need to build it yourself. This has largely been true since the dawn of the computing era, but the modern age we've seen prebuilt manufacturers taking huge strides towards closing that gap, especially amongst machines targeted specifically at the gaming audience. Manufacturers seem to have realized that gamers are largely an enthusiast audience and a higher percentage of them are likely to have the technical competence and value savvy to construct their own rigs if going that route will save them some of their hard earned cash. The result is a growing field of really excellent machines that are closing the gap on DIY pricing, or, in the case of our top choice, iBuyPower's RDY ELIBG205, are actually bettering it. So where do you start when you're picking out the best gaming PC? First, you need to frame your decision around your needs and budget. If you've just sunk a bunch of cash into a beautiful 4K panel or an awesome 4K gaming monitor, you're likely going to want a very high-end PC or all those glorious pixels will end up largely wasted (or you'll end up watching a very high resolution slide show when you load up the latest triple-A title). For reasonable 4K, you'll likely want to shop prebuilts with RTX cards and at least 8th gen Intel processors (or their AMD equivalents). But if you're purely looking to game at 1440p, or want to push excessive frame rates at FHD, you can save yourself some cash and look at machines with older GTX cards or even something in the RX 570 or RX 580 range. Regardless of which machine you end up landing on, you'll want to pair it with the best gaming keyboard and best gaming mouse. And if conversation about PC hardware makes your head spin, be sure to check out our hardware glossary for explanations of many of the common terms. The ELIBG205 is the best gaming PC you can get for a number of reasons, the most crucial of which is that it's a ridiculously powerful machine that you can buy from the manufacturer for less than it would cost you to assemble it yourself (by a margin of nearly $200). It's loaded for bear with an RTX 2080 Ti and a scorching hot Core i9-9900K processor, and is one of the only machines we've tested that's capable of realistically handling modern, triple-A titles at 4K Ultra anywhere close to 60 FPS. Even the extremely demanding, GPU devouring Metro Exodus, with its ridiculously gorgeous landscapes and much vaunted ray tracing support, runs smoothly at 30 FPS or more. There are also some thoughtful additional features, stuff like toolless case access by removing either side panel, and a ton of USB ports to plug all your peripherals into. It also comes under the aegis of a nice three year warranty, so you can rest assured your investment won't crumble on you a few months into its life cycle. Best for... Anyone looking to buy a high-end gaming PC. 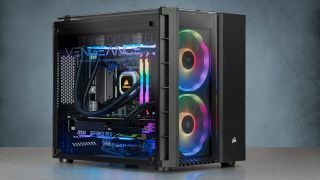 While at first glance the Corsair Vengeance 5180 might seem like a lot of RGB lighting, signifying nothing, the reality is it's packed with powerful hardware and some thoughtful design decisions that elevate above even the other gaming PCs on our list. Inside the spacious case you'll find one of Nvidia's mighty new ray tracing cards, the RTX 2080, and a very capable Core i7-8700. It also comes with a very welcome, generous 480GB SSD as well as 2TB of traditional storage. The glass tempered panes of glass on the front, side, and top and massive RGB light-show might be the headline (or at the very least, most eye-catching) feature, but the 5180 is no slouch in performance, either. One of my favorite features is actually the case design. While it's a pretty massive piece of kit, the space is used extremely well in a dual-chambered design that separates the motherboard, GPU, and RAM into one side and the storage drives and PSU into the other. This makes tinkering a breeze, with no massive cable snakes to navigate around when you're swapping out the graphics card or adding RAM. On the other side, handy removable hard drive bays allow you to easily add additional storage if you're so inclined, and all the PSU cables are wrapped and neatly tucked so they won't interfere. Of course, if you do fancy an RGB light show from your desktop, the Corsair can be lit like a Christmas tree and becomes a flashing, 16.8 million color equipped show piece for the easily impressed amongst your friends and families. Even as someone who's not a particular fan of the RGB frenzy currently gripping gaming PC and accessory manufacturers, I don't hate the candy colored display the Corsair presents every time you power it on. If you're really not sure if PC gaming is the way to go and just want to dip your toe, or if you only want the minimum specs (maybe so you can add onto it in the future, maybe to use as a streaming machine), you probably don't want to blow tons of money on your pre-built. That's where the Acer Aspire comes in - which is to say it's well below the $1000 / £1000 line. It comes equipped with an AMD Ryzen 5 1400 CPU, 8GB of RAM, an Nvidia GTX 1050 graphics card with 2GB of dedicated video memory, and a 1TB hard drive. None of these are top of the line components, of course, but they'll outperform everything save for maybe an Xbox One X. And for less than $800, it's a remarkable value. Keep in mind too that you can always give your Aspire a boost down the line with more RAM, an SSD, or a more powerful GPU. In the meantime, this will run most modern games at 1080p, 60fps on high or ultra settings, and that's nothing to sneeze at. The Aspire is a great console replacement option. If you've been stuck on PS4 or Xbox and have heard your friends chattering about the huge number of PC exclusives that get dumped onto Steam every month, the Aspire is an excellent starting point. If you're on an even tighter budget, or maybe are buying a cheap PC to haul to college or a second machine to run background executables, there are even cheaper options in the Aspire family with integrated graphics. They won't do you many favors if you're looking for a gaming machine, admittedly, but they can certainly handle streaming video if you want to offload your second screen onto a different machine, and they will certainly handle older/indie games or MMOs/MOBAs - in other words, a lot of the games that you come to PC to play in the first place. There's something sort of mystical about the Obelisk that encapsulates some of the most exciting facets of our hobby. The sleek, hard angles of this HP rig mirror the object its named after, a dense black cube of potentiality ready to unleash the most beautiful and intense games of this generation. True to that design, the Obelisk is trim and compact and powerful. It cuts away the fat, eschewing overblown RGB lighting or the elaborate tentacles of a liquid cooling setup, focusing instead on delivering sheer performance at a very attractive price. For around the $2,000 mark, the Obelisk comes packed with a very nice 8th gen Core i7-8700 and a high end RTX 2080, only one step down from Nvidia's most powerful 20-series, ray tracing focused graphics powerhouse. It also boasts a speedy 256GB SSD and a generous 2TB standard HDD, so you'll have plenty of room to load your most demanding games onto the faster storage and tons of leftover room for everything else. While the Obelisk's case is smaller than the similarly specced Vengeance, it's not tiny by any means, and the air cooling solution the Obelisk provides has been more than sufficient during testing to handle even heavy gaming loads. It does make swapping out components slightly trickier than the Vengeance's massive dual-chamber case, of course, but that also means it'll fit more easily into smaller spaces. The Obelisk tucks neatly under a desk, or can even slide into a larger entertainment center if you want it to be the central unit in your living room media showcase. If you're looking for the best of both worlds, a powerful processor to handle workload and a top-end graphics card to make your games shine in 4K, Skytech's Legacy Extreme is one of the most reasonably priced and impressively kitted out power PCs on the market. Coming in well under the $3,000 mark, it nonetheless packs Nvidia's shiny new RTX 2080 Ti, the top end GPU in its much ballyhooed new raytracing family of cards, as well as Intel's potent Core-i9 9900K, their top mainstream 9th gen Coffee Lake processor. This beast will easily handle any games or apps you feed it, and laugh off even intense video rendering or editing tasks. The only shortcoming in the Legacy Extreme's default configuration is its 16GB of RAM. While that's not an insignificant amount of memory, it is a bit on the slight side for a PC packing this much horsepower. But given that you can find this monster at around the $2,600 price mark, it's perhaps not surprising that some cost cutting measures were taken elsewhere in the build. Luckily, RAM's fairly cheap at the moment, so if you do want to upgrade, you can do so fairly inexpensively. Otherwise, the Legacy Extreme is a future-proofed behemoth, a gaming titan that shouldn't require meaningful upgrades for many years to come. It even comes with a terabyte NVMe SSD, the new PCIe powered ultrafast storage solution, to ensure loading screens are practically undetectable. The Corsair One series is incredibly small and lightweight (at least considering how much power it's packing), and has an attractive form factor. As a step-up option from Corsair's flashier but more modestly outfitted Vengeance model, the Corsair has a few advantages that will primarily appeal to those looking for more workload capability and who are focused on gaming as a more secondary concern. The Corsair One is decidedly a workstation focused rig, though it certainly doesn't slouch in the gaming department either. The One comes in a few flavors, but the best dollars-to-performance value is in the package around the $3,000 mark. It's built around the same GPU as the Vengeance, an RTX 2080, and contains the same storage drives, a 480 SSD and a 2 TB HDD. Where it exceeds the Vengeance's specs are in the CPU, an overclockable Core i7-9700K, and also in a nod to megatasking workload scenarios, it packs double the RAM, at 32GB of DDR4-2666. It will manhandle modern games at 4K with ease, and it's also suitable for heavy rendering, CAD, or other workstation style applications. If that's not enough horsepower for you, however, for another $600 you can raise the bar all the way up to the most powerful mainstream card Nvidia produces, the RTX 2080 Ti, as well as moving up to a Core i9-9900K, a ridiculously powerful processor. It's sort of the ultimate gaming/workstation hybrid, though if you find your bank balance is absolutely bursting with discretionary income, first, call me, but second you might also want to consider the top option in the Corsair family. The ridiculous $5,000 option includes the $1,200, wildly overpowered 9th gen Core i9-9920X CPU, which Intel insists on describing (and probably rightly so) as the "best processor for gaming." It also throws in a massive 960GB SSD so you can stash practically all of your games and applications all on a speedy static drive. MSI is known more for their components than their complete pre-built gaming PCs, but that shouldn't stop you from considering the MSI Aegis 3. It's not the most ludicrously powerful machine out there, but it's well beyond a budget PC, too. And thanks to its lightweight, portable design (it has a built-in handle!) you can always say "yes" when your friend asks if you can bring your PC over for a LAN party. Packed in the Aegis you'll find an excellent Core i7-8700 processor, a GTX 1070 Ti with 8GB of onboard video memory, 8GB DDR4 RAM, and a 256GB SSD paired with a 2TB HDD. Really, the biggest drawback is the Aegis' garish design...though, okay, yes, it does have kind of a Dead Space helmet vibe going on. If you're okay with that aesthetic, this is an excellent mid-range gaming PC, and still outperforms even the most powerful console. The Neuron is a well specced machine, packing a mighty RTX 2080 and a powerful Ryzen 7 2700X CPU, and is one of the most customizable PCs money can buy, particularly in terms of aesthetics. On top a range of options for what parts you want included in the machine, Origin will let you get nearly any image you provide them etched onto the beautiful tempered glass that makes up the side panel of the Neuron, so get your best cat GIFs or memes ready. You can even decide to have them UV etched or added as textured images for a more tactile experience. The Neuron also features some nice quality of life touches, like the side panel that magnetically seals and can be swung easily open, entirely without tools, to access the performance parts and do any upgrading your heart desires. And it's competitively priced at $2,399, putting it in direct competition with the top PC on our list, the Corsair Vengeance.